Project Spotlight: Celebrating World Water Day with BBI’s Infrastructure Team — Binkley & Barfield, Inc.
March 22 is World Water Day—a day that was created to increase awareness of the current global water crisis. This year’s theme for World Water Day is “Leaving no one behind,” which follows the promise of the 2030 Agenda for Sustainable Development, ensuring availability and sustainable management of water for all by 2030. To celebrate World Water Day, we want to highlight one of BBI’s own projects that is currently increasing the availability of raw water in our local community. With the Luce Bayou Interbasin Transfer Project Dual 96-in Raw Water Pipeline project, BBI’s Infrastructure team assisted in the planning and design of three miles of dual 96-in raw water line, running from Caper’s Ridge Pump Station on the Trinity River to the Luce Bayou Interbasin Transfer Project Canal in Liberty County. According to Chris Campbell, PE, the project manager for final design and limited construction phase services, the project was challenging and fun since it had to be designed over terrain consisting of rolling hills and across a drainage gully in the woods north of Dayton. 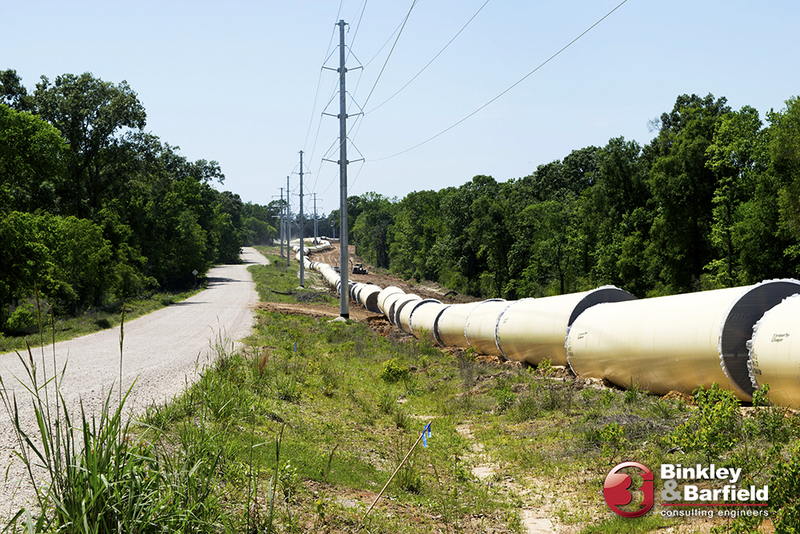 With the changing terrain, it was a challenge to keep the flowline constant and ensure the pipeline material could withstand the loads from backfill material and vehicle/construction loads. BBI’s Infrastructure team happily accepted this challenge, and with the success of this project, they have made a significant contribution to increasing the availability of raw water to our local community.